The first absolutely airtight storage container for dry pet foods and seeds.. No more bulky awkward bags exposing food to air excessive moisture and pests. 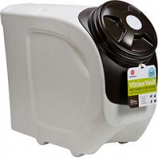 With a spin of the patented lid the vittles vault locks in freshness and flavor.. . . Highly digestible provides a complete and balanced nutrition your dog needs to live a healthy energetic life.. Fortified with essential vitamins and minerals.. Low fat and carbohydrates with no added antibiotics hormones or preservatives.. 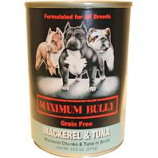 Grain Free. .
Made from high quality stainless steel, these pet food canisters are a great way to store pet food. The air tight canisters will savour the flavor, crunch and freshness of the pet food/treats for a long time. It’s an easy and convenient way to carry food and treats for pets while you’re outdoors. The handle on the lid top makes it more convenient to open the canister. The beautiful Paw print design will look good in any household. The Paw Print Pet Canisters has been manufactured by Iconic Pet, creator of high-quality products. With the help of these specially designed canisters for dogs and cats, you can easily differentiate between pet food and human food. The see through access on the lid saves you precious time in making your list for groceries. The canister is made form tuffest and finest quality stainless steel material and is very easy to maintain. 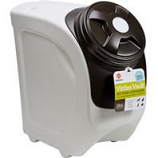 These canister by Iconic Pet are air tight and keeps pet food fresh for a really long time. The See Through Pet Canisters has been manufactured by Iconic Pet, creator of high-quality products.